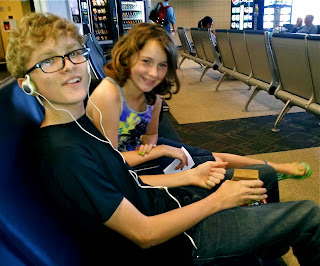 to head to Texas to visit for the Summer. The theme for this week’s #SundaySupper is Kids in the Kitchen. I think that fostering a love of cooking/baking from a young age is a wonderful way to pass down family recipes...and spend quality time with the kids in our lives. Since my Lucy-cat lacks the opposable thumbs needed to be my sous chef, I immediately thought of my teenage nephew, Wolf, for this week's post. He loves to cook...and he’s quite good at it! He’s visiting my parents in Houston from Ohio for the summer...but I’m four hours away. We weren’t able to actually cook together for this post, but we did collaborate via phone to create a kid-approved Summer dessert. I’m going home next weekend for a visit, so we’re going to make these sundaes together for the entire family then! Summer in Texas is hot -- really hot -- and ice cream is one of the best ways I know to cool off! That idea was the starting point for Wolf and I. We came up with a dessert that will make chocolate lovers go weak in the knees: Wolf’s Wonderful Peanut Butter-Brownie Fudge Sundaes. Wipe the drool off your face and imagine this: layers of peanut butter-swirled brownie, vanilla ice cream mixed with crushed Butterfinger candy, peanut butter-infused fudge sauce, and whipped cream. This one’s a splurge for sure...so make sure to eat a healthy dinner before indulging in this over-the-top dessert!! Since there are several components to this dessert, we decided to keep it easy. We used brownie mix, Blue Bell homemade vanilla ice cream, and store-bought fudge sauce to save time. My theory is this: the quicker the sundaes are assembled? The quicker you can eat them!! So...let me show you how to create this delicious sundae. Please note that I'm demonstrating how to make three small sundaes since that’s all Michael and I need to have on hand at one time during swimsuit season. However, you’ll have enough brownies and fudge sauce to make up to eight sundaes...simply adjust the amount of ice cream and Butterfinger if you want to make a family-size batch. Step 1: Soften one pint of vanilla ice cream in a bowl -- living in Texas, Blue Bell is our ice cream of choice! Add 1 cup crushed Butterfinger candies and mix until thoroughly combined. Note: 1 cup = about two large bars. Spoon the softened ice cream back into the container and refreeze for at least an hour, while you assemble the rest of the sundae ingredients. Step 2: Line a 9x9 pan with parchment or foil. Bake your favorite boxed brownie mix according to package directions, swirling four tablespoons of peanut butter into the batter with a knife before baking. For reference, I used Ghirardelli Double Chocolate brownie mix and Peanut Butter & Co.'s White Chocolate Wonderful peanut butter. Cool brownies completely and cut into bite-sized chunks. Step 3: While the brownies bake, make the peanut butter-fudge topping by combining 3/4 cup of your favorite jarred chocolate fudge ice cream sauce, 1/2 cup chunky peanut butter, and 1/2 cup half and half in a small saucepan. Heat over med-low heat, stirring well to combine, until the sauce is melted and a nice consistency. 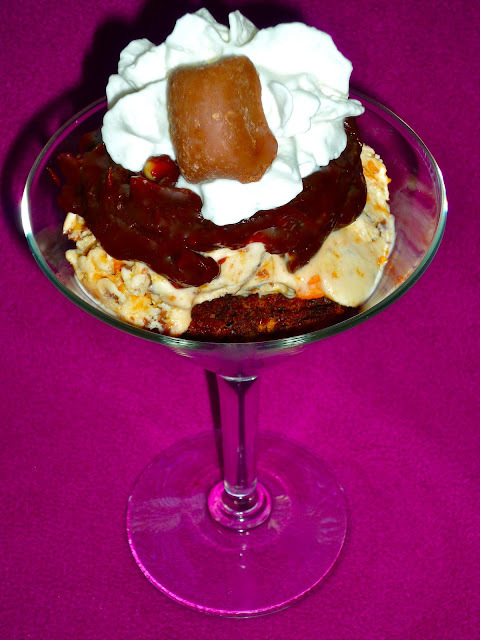 Step 4: To assemble the sundaes, layer the ingredients in a clear sundae glass or bowl as follows: four or five brownie bites, ice cream, fudge sauce, and whipped cream. Top each sundae with a bite-sized Butterfinger bite if you have some on hand. I bought a package of them to place on top for presentation. Don't forget a spoon...and dig in!! This sundae is SO delish...chocolate and peanut butter is a classic flavor combo for a reason! The layers of flavor worked very well together, but the Butterfinger in the ice cream was what brought all of the other flavors and textures together. Like I said earlier, this sundae is pretty rich. I was able to get three sundaes from my pint of ice cream...with plenty of brownie bites and fudge sauce left for more sundaes later in the week. Simply save the leftovers in freeze-proof containers until the craving for another one of these sundaes hits...and I promise that it will! I hope you'll take some time to visit my fellow #SundaySupper food bloggers and check out all the family-friendly recipes that they are sharing today too! And be sure to join us for a live chat via Twitter at 300 EST today...use the hashtag #SundaySupper to join in on the fun!! All I have to say.... Wolf has really good taste and he can come and cook #SundaySupper Dessert for me any day! My kids will love this recipe! Make sure to have them brush their teeth before and after eating this...it's sticky sweet! Worth the splurge, though! Wolf has the right idea, Wendy! Yum!! Yes...I agree! He can be my sous chef any day!! Yes...it was really good! Chopped Reese's would be the same flavor profile, but a different texture! My sweet tooth just screamed at me. It said, "Make this NOW!" It is very sweet for sure...but sometimes you just want an over-the-top sundae, yes? Oh my this looks to die for! It's really sweet, but really good...lots of layers of flavor! I do NOT miss Texas humidity! What a great way to cool off! Luckily, the humidity isn't as bad here in San Antonio as it is back home in Houston! We survive, but July and August are always pretty brutal for us! This looks kid and grown up approved to me! Love that you cook (or will cook) with your nephew, that is awesome! I would cook with him all the time if he lived closer...he makes AWESOME bento boxes! We have collaborated for a cooking contest with Biscoff...and I hope we can do more collaborations in the future! I'm not a peanut butter fan (I know, I know), but I'm sure this is delicious if you are. Neither is Michael...he liked the Butteringer ice cream part of this, but the rest was kind of meh to him. He's more of a PB&J fan. Seriously good dessert! What a great combination, especially for chocolate and peanut butter lovers. Oh wow Wendy I can't loose the grin or the drool.... Absolutely fabulous and your fast assembly, a must in Florida too!!! Yes...ice cream is about the only thing that can cool down a hot day, which seems to be an issue all over the US this summer!! He's already been talking about it on Facebook, so I think he's excited to help me whip up a batch next weekend! This sundae looks incredible. I am now craving this. And, blue bell ice cream is the best. Love the sauce! Happy #SundaySupper! Yeah...Blue Bell is pretty awesome ice cream! Although we discovered that Tillamook is pretty darn good too during our visit to Portland last month! Okay I'm totally coming over. You can start mine now. Be there in five. 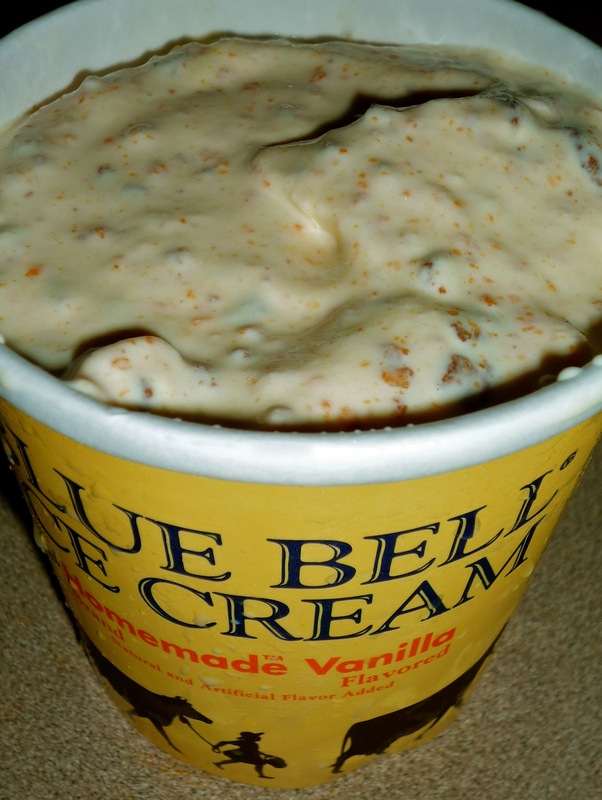 Come on over...we'll buy a gallon of Blue Bell and a case of Butterfinger to mix in! That's one thing we have plenty of in Texas in July: warm weather!! Every ingredient of this sundae sounds fabulous! I´m dying to try the brownies. Kudos for your sous-chef! Each piece is tasty...together? It's over-the-top good!! I don't make brownies all that often...and this was a really good mix! Ghirardelli is a good product!! My kids would love to make this! Very nice. Hey girlie...you should make this with your kid during Summer break. Then have them do something to burn off the extra energy from all the sugar!! Wowza! That bowl is the kind that you dive into and don't come out of for hours. I can just see the eyes popping around my table if I served such a great dessert! Yes...a little goes a long way, though. Concentrated sugar and all! Wendy, I'm wiping the drool off of my face! Yum, this looks terrific! If you love chocolate, this is a dessert right up your alley! I had the last little bit of ice cream after work today, but am saving the brownies that are left to take home this weekend for when Wolf and I make another round of sundaes! ooh, this looks sooo good! by the way, i just realized that your blog posts haven't been coming through on my reader. the horror! going to un-subscribe + re-subscribe + hopefully that'll fix it!